EPA registered and provides immediate relief from flying insects. The dispenser is for use in stalls, barns, bathrooms, kitchens and any other enclosed area. 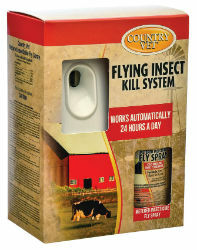 The Country Vet Dispenser automatically discharges a fine mist of metered fly spray or CV air freshener once every 15 minutes. It features a superior motor with self-lubricating gears, a patented drive-stall mechanism and positive nozzle alignment. Set it up in problem areas, and forget about it and the bugs for a full month. Kills and repels flies, mosquitoes, gnats, and small moths. Covers 6,000 cubic ft. Operates on 4 "AA" batteries (not included) Kit includes: one beige dispenser unit and one 6.4 oz. can of Bug Killer II fly repellent.